Longtime “Wheel of Fortune” host Pat Sajak is a national treasure. Don’t agree? Fight me. 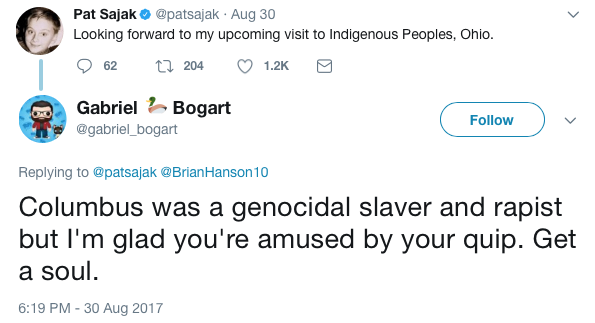 Sajak’s latest hilarious tweet is making its way around the interwebs, this time taking aim at the Los Angeles City Council for their decision last week to rename Columbus Day to Indigenous Peoples Day. Sajak, who is notorious for sending out tweets pointing out the hypocrisy of the perpetually offended, tweeted about his upcoming trip to Columbus, Ohio. While Sajak’s tweet was clearly a slam joke against those mortally wounded by words in the City of Angels (and all others who want to change history), there was a single hater among all Sajak’s followers that clearly has no concept of humor. Whatever Christopher Columbus was, he hasn’t been so for 500 years -- being that he's dead. He’s not coming back anytime soon, and it's not like his memory will influence any copycats. When’s the last time in the last 100 years you heard anyone say they want to be just like Columbus? The answer is you haven’t.